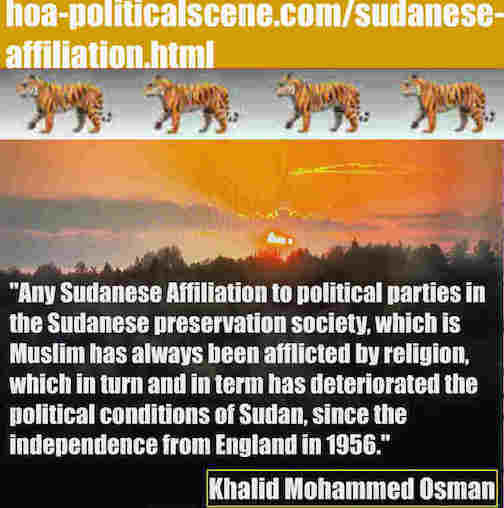 Sudanese Affiliation to Political Sects and Religious Parties! Any Sudanese Affiliation to political parties in the Sudanese preservation society, which is Muslim has always been afflicted by religion, which in turn and in term has deteriorated the political conditions of Sudan, since the independence from England in 1956. 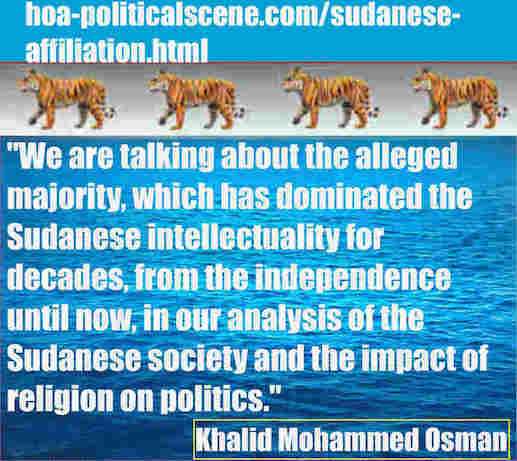 We are talking about the alleged majority, which has dominated the Sudanese intellectuality for decades, from the independence until now, in our analysis of the Sudanese society and the impact of religion on politics. In the lights of our political analysis of this society, we see that the situation of the Sudanese society as a conservative Muslim community has helped to have the use of religion in politics possible. Such use of religion in the politics of the state have a very bad impact on the Sudan's political progress. 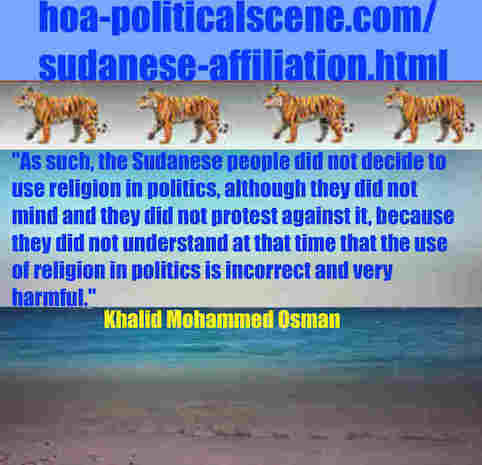 hoa-politicalscene.com/sudanese-affiliation.html: Sudanese Affiliation: إنتماء سوداني. Khalid Mohammed Osman's political sayings in English 1. أقوال سياسية لخالد محمد عثمان. Intro to Index 13, Episode 13: Sudanese Affiliation! Before getting deeper into the Sudanese Affiliation, you might need to get through the introduction to know about this Sudanese political article and the sources it has. It is episode 13 amongst more than 200 episodes in a Sudanese sequence of articles. 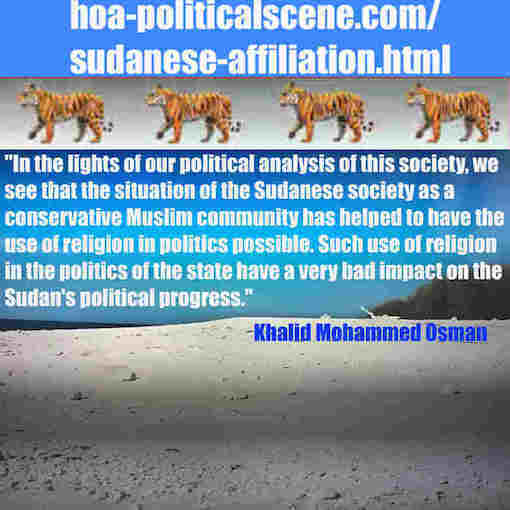 The Sudanese political affiliation... and this is the Arabic version of it that linked here, comes in series of Sudanese political articles I have built in so many episodes to organize the Sudanese political section of the Horn of Africa's Network. Episode 25: Sudanese Analyses, with its Arabic version at Sudanese Political Analyses. 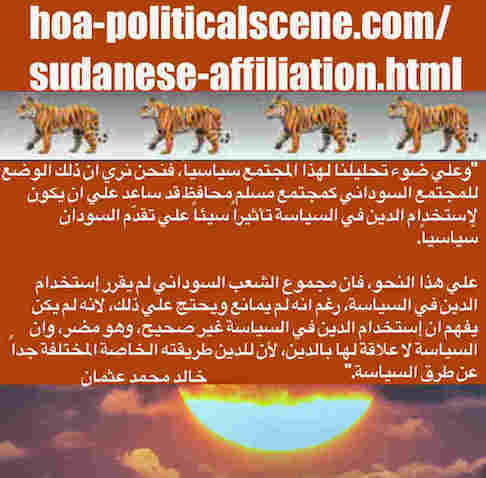 hoa-politicalscene.com/sudanese-affiliation.html: Sudanese Affiliation: إنتساب سوداني. Khalid Mohammed Osman's political sayings in English 2. أقوال سياسية لخالد محمد عثمان بالانجليزية. 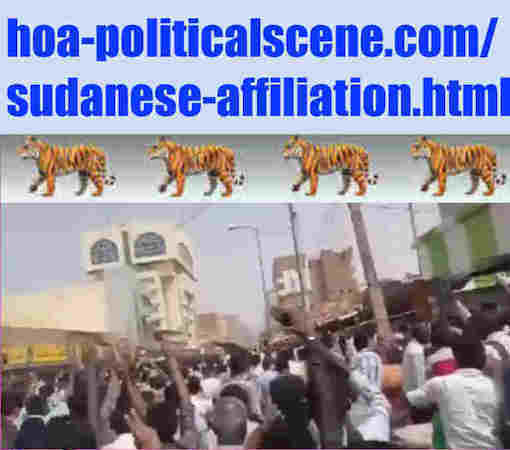 hoa-politicalscene.com/sudanese-affiliation.html: Sudanese Affiliation: تبعية سودانية. Khalid Mohammed Osman's political sayings in Arabic language. أقوال سياسية لخالد محمد عثمان. Sudanese Affiliation to Religious Sects! As such, the Sudanese people did not decide to use religion in politics, although they did not mind and they did not protest against it, because they did not understand at that time that the use of religion in politics is incorrect and very harmful. They didn't know that politics has nothing to do with religion, because religion has its own different way which is ethically pure and different from politics, which is not ethically pure. They also didn't understand that religion is something personal and private between the individual human and his/her God, while politics is not private and it has no God. Strangely and painfully, we have Gods of politics in Sudan. Those who are always using religion in the state politics and in forming political parties to have followers to obey them, because they think of themselves as small Gods who lead the people to the big God. Forget about this sarcasm, I am always intending to flavor my political articles with. In reality the small Gods are the leaders of the Sudanese sectarian parties. Those are the spiritual leaders who always have followers, from all of the social classes to follow them responding to some religious superstitions amalgamated with some myths of politics. Seems as if Sudan is a wonderland? But, regardless to the affirmative question, we learned through long painful years to reject all of the Gods. The people are Gods. They are Gods of their destiny to be free from the superstitions and the myth of politics. They are free to build the modern, secular, and united state they want. They want the religion out of the state politics and back to its place in the society. So, loyal and sincere Sudanese nationals have not any party of God. They don't have any Sudanese affiliation to such party. 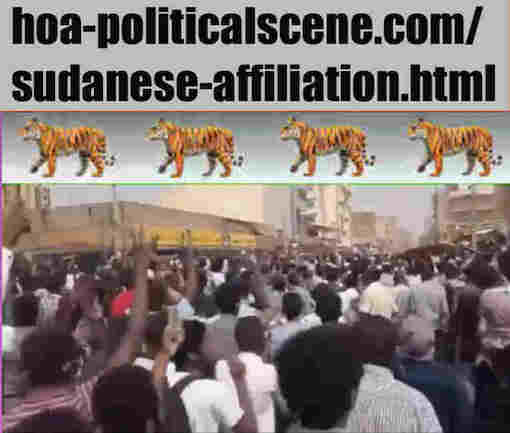 hoa-politicalscene.com/sudanese-affiliation.html: Sudanese Affiliation: إنتماء سياسي سوداني. Revolutionary Ideas. نمو الأفكار الثورية، الثورة السودانية. Sudanese uprising, February 2019. In reality, the brainwashed majority of the Sudanese people have been affiliated to the Sudanese religious and sectarian parties. These people represent what the sectarian parties call as the majority they have to assume power. Although such affiliation was similar to issues affecting most of the masses of these parties, the religious loyalty to the leaders of these parties was the cause. And the cause was the brainwashing of those who become loyal through the policy of burning the political stages in Sudan, along with the policy of mental absenteeism. In addition, these religious and sectarian parties were buying votes, through which we see that the high degree of political ignorance planned by these parties has also contributed to such party orientation. Creating narrow-minded and loyal followers through forged affiliation process has taken place for these parties to have their majorities. This high percentage of political ignorance has affected the masses because it was a product of the policies formulated by the sectarian parties, which made mental absenteeism realities in the Sudanese political climate. The policies to make absence of the Sudanese mentality caused the political orientation of the masses, considering that the personality of the political leader represents a religious ideological orientation, and thus the Sudanese political subordination of these parties leads to paradise. Why the Sudanese Communist Party hasn't Been Successful to Eliminate Misconception of Politics? This coupling between politics and religion has affected the minds of the masses belonging to those sectarian parties, in a situation, which lacked a secular nationalist Sudanese party that takes on enlightenment and political education, and fights against the politics of making absence of the Sudanese political mentality. The Sudanese Communist Party, the best Sudanese party, did not realize that at the time, and it was centered on the fact that, as a communist party, it found itself in a very embarrassing circle in a predominantly Muslim society, and thus focused on this aspect to prove that it was not an atheist party. Thus, the party was preoccupied with this narrow content, despite its modest cultural activities, especially in the period leading up to the July military uprising in 1971, which did not achieve the desired majority of the SUDANESE AFFILIATION. The Sudanese Affiliation to Muslim Brothers and the Role of Their Party! The sovereignty of the Sudanese sectarian parties in turn has brought them control over things, in the same way that they controlled the minds of the masses, because of religion alone. It does not differ in this approach from the Islamic Party of the Sudanese Muslim Brotherhood. In fact, both of them, the religious and the sectarian parties have been emerging and exchanging roles in the politics of the absenteeism of the Sudanese collective mentality by using religion to control the masses. These right-wing parties have contributed to the brainwashing of the Sudanese political mentalities through Sudan's long history since 1956, revealing the deepest impact of the Sudanese political affiliation. But the Muslim Brotherhood had surpassed the rest of the sectarian parties to plan what I call, the policy of burning the political stages of the Muslim Brotherhood to continue not only in power, but at all political levels, including the opposition and at all levels of the Sudanese life. In the opposition, and where they were actually the third majority in the so-called democracy in Sudan, and exactly during the third democratic period, in which the Umma Party held power and the leader of this party was prime minister, the Muslim Brothers conducted their coup in 1989. Despite the family relationship the PM of the third democracy has with the head of the Muslim Brotherhood in the organization of the so-called Islamic National Front (NIF), Al-Turabi turned against him and brought Omar al-Bashir to power through that military coup. This reveals the depth of the Sudanese political subordination and the extent of the influence of the relationship in religion and the relationship of the family in the conduct of political affairs in Sudan, and that is farce after farce. But the policies of the Muslim Brotherhood were not confined to the confines of the sectarian parties in the policy of burning those sectarian parties in the policy of burning the political stages, regardless of the religious and family relations between the leaders of the two sectarian parties, but went beyond to the organization of the Muslim Brotherhood itself. The Islamic Party has carried out a policy I call the policy of the octopus arms to grow roots of the Muslim Brotherhood through internal divisions, one of which claims to be in power, while the others turn into the opposition. They did this when they split into a National Congress Party in power and a Popular Congress Party in the Sudanese opposition. This political camouflage keeps them always present in the Sudanese political scene as a political organization. It keeps them present in the Sudanese political climate, even if when they split that causes one of the leaders to go to prison, or even when one of the party leader who claims the opposition is executed. The policy that keeps the organization going is very important, and is superior to the policy of keeping individuals in command. Thus, the Sudanese political affiliation in this context becomes a purely pragmatic. such affiliation to the Muslim Brotherhood, all of these policies follow the approach planned by this party through a conspiracy theory, especially in that aspect that concerns them, which I described as the conspiracy theory of the Muslim Brotherhood in Sudan. The Islamic organization is essentially not purely Sudanese, but the Muslim Brotherhood in Sudan is only a regional wing of the Muslim Brotherhood in the Horn of Africa. They were instrumental in extending the terrorist project to Eritrea by organizing Eritrean Jihadists, Ethiopia, and other states. Before that they contributed to the extension of terrorism through al-Qaeda. On this basis, the Sudanese political subordination within this Chauvinist party is not a purely Sudanese political subordination. Have A Say in the Sudanese Affiliation? You can comment on this page about the Sudanese Affiliation, write comments on Sudan, write new political articles on the Sudanese Online platform, write about Sudan, and share all that you have written on the Sudan Online framework with your HOA friends. Use the following Comment C2 Entries form to do that, write your email in the secure page to receive notifications and do more. Thanks. In addition to SUDANESE AFFILIATION, you might also be interested in some Sudanese issues in documentary film at TVCinemaApp.com. Comments on SUDANESE AFFILIATION, or any comment on Sudanese issues here on this page appear at the section below the comments form and above this paragraph.